On the face of it, technology is supposed to make our lives easier. Despite our amazing advancements, the average man has higher stress levels than ever before. In this context, it doesn't seem surprising that there is a connection between stress and weight loss, or even weight gain. Fortunately, you can do something about it! With a little help, you can understand what triggers stress, which situations you can avoid and how you can use the connection between stress and weight loss to your benefit. Stress is effectively your body reacting to a change in your environment. It is particularly relevant when your body needs to be prepared to respond. In stressful situations, your hypothalamus and pituitary glands signal the adrenal gland to release cortisol, preparing your body for fight or flight. It is an important reaction that can save you from harm. Unfortunately, in the modern world, there are many things that can cause your cortisol levels to rise. It’s not always possible for your body to decide between a life and death moment and your weekly meeting with the boss. Stress in the long term, also known as chronic stress, can effectively wear your body out emotionally and physically. Studies show the more stressed you are daily, the more likely you are to contract a range of diseases, including damage to your nervous system and even your brain. This includes your ability to remember, long term stress is believed to increase your likelihood of contracting Alzheimer’s. It is now very difficult to escape work when out of the office. Your cell phone allows clients, colleagues and your boss to contact you at any time. This increases your stress levels as you are unable to switch off. In addition, the distraction connected with your cell phone means that you are less able to focus on other things. In fact, studies show that high phone use is connected with poor cognitive skills. Sleep is essential to the human body, but your cell phone can reduce the amount of sleep you’re getting. All you need to do is check it before bed, and you've stimulated your brain instead of allowing it to relax. As you’ll see in the next section, this has a knock on effect that connects stress and weight loss. Several things go viral every day, and most people want to stay on top of the trends or even be the one that shares news first. Unfortunately, this can lead to a fear of missing out, which results in looking at social media more than necessary; affecting every area of your life. Your cell phone also allows you to check what your family, friends and favorite celebrities are doing. You’ll automatically compare your life with their glamorous one and feel inadequate. This will increase your stress levels as you worry about why you are not good enough. Of course, you conveniently forget that only the good bits of anyone’s life are posted on social media channels. 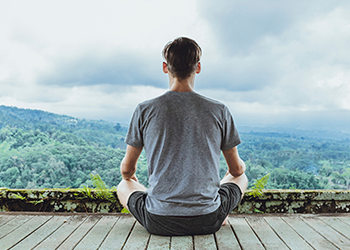 You know you’re more stressed than you need to be, but to really get the motivation you need to reduce your stress levels it’s important to understand the effect stress has on your body. As soon as your body senses a situation that is likely to need a physical or emotional response from you, it will release the hormone cortisol into your bloodstream. Cortisol is actually an important hormone for many processes in your body; this is why there are cortisol receptors virtually everywhere. These receptors are essential as they allow cortisol to attach to them and then tell the cells in your body what to do. It’s important to note that the release of cortisol prevents your body from creating many other hormones, such as testosterone. Your body needs to be able to run or fight, and this takes energy. In preparation for this cortisol releases glucose into your body, which increases your blood sugar levels ensuring your muscles have the energy available to them that they’ll need to react properly. Unfortunately, most stressful situations in modern life don’t actually require physical effort. This means that blood sugar levels have increased for no reason. If glucose remains in the blood and is not used, then your body will release insulin to convert the glucose back into body fat. However, increasing your insulin levels too often can lead to insulin insensitivity, which is the precursor to type 2 diabetes. The next step is that your breathing increases, allowing you to take in more oxygen which is essential to ensure your organs have enough to perform as you run or fight. Again this is connected to ensuring your body is ready to respond. The increased blood flow ensures that the oxygen and glucose are available to the relevant muscles. This is what allows you to run away and has also been linked with the ability to temporarily perform feats of incredible strength. Once the immediate ‘threat’ is over the body will stop cortisol production. This allows your heart rate and breathing to return to normal, and your body can start to produce other hormones again. The stress response is natural and an important one; your body needs to be ready for any situation. Unfortunately, the problems start occurring when you are under too much stress, and your body doesn't have time to return to normal. Cortisol is known to prevent the release of other hormones. It is particularly detrimental to your immune system; reducing its ability to fight off infection and making you more vulnerable. A natural response, when stressed, is for your muscles to tense up. This protects you from injury but can also cause aches, pains and even headaches. The endocrine system is essential to regulate your mood, tissue function, growth rate, and metabolism. It is this part of your body that controls the release of cortisol and epinephrine to give you the energy you need in stressful situations. Your intestine has a reduced ability to absorb nutrients when you are stressed. If you are stressed when you eat or shortly afterward your body won't be as efficient at absorbing the nutrients you need from your food. This will reduce the ability of your body to build lean muscle, and it can give you stomach pain, bloating, diarrhea or even constipation. Anything that stops your body from working properly is likely to reduce or increase your appetite and therefore cause you to lose or gain weight. Put simply, stress causes your body to malfunction. Being stressed is not a healthy way to lose weight. You may also find that if you remain stressed, your body will actually crave food to ensure you have the energy you need to fight or run away. The food it craves will be high sugar content which can be quickly converted into energy. When you didn't actually need to expend extra energy this extra food will be converted into fat and stored in your body, causing weight gain. The fact that these types of food are generally addictive will make it easier to gain weight. In short, chronic stress can cause weight loss or weight gain! Clenched jaw or grinding teeth. As you can see, you can lose weight by staying stressed all the time, but you can also gain weight by adopting this approach. Neither is desirable as high-stress levels affect virtually every part of your body, preventing it from working properly while increasing your chances of contracting age-related diseases. That’s why you need to lower your stress levels. Even if you want to gain healthy weight, (muscle mass), your stress levels need to be lowered. Stress and weight loss are linked as intrinsically as stress and weight gain. Fortunately, you can take steps to lower your stress levels and improve your health today and in the future. This is definitely easier said than done. But when you feel stressed or the beginning of being stressed try to look at the positive in any situation. This will help to reduce your stress levels. It can be difficult to stay positive when facing a stressful experience. A good technique is to think about your breathing, focus on breathing into a count of 5 and then breathing out to a count of 5. Exercise has been shown to reduce stress levels. It does this by boosting your endorphins and making your body feel happier. This has a knock-on effect on your brain and can help with your mood, reduce tension, improve your sleep and increase your self-esteem. If you’re not sure where to start then take a look at this workout and join the FF30X to get more inspiration. Most processed foods are high in sugar which is actually addictive; it’s the reason you keep choosing the wrong food despite your great intentions. This is a good reason in itself to eat more healthily and avoid the processed foods. You can always try the perfect plate method. But, it’s more than that. Being stressed reduces the amount of magnesium in your body, but this mineral is essential to preventing fatigue, insomnia, and even stress! By eating a healthy and natural diet, your body will be better able to deal with stress. One of the biggest reasons many people become stressed is that they are running out of time. Think about it; you can practically see your heart rate rising when you’re running late for work, to pick the kids up, or for an appointment. By learning to plan your time better and giving yourself a little longer to get places you’ll eliminate tons of stress. Sleep is one of the most important things your body does. It’s when you’re sleeping that your hormone levels are balanced and your muscles recover. The average man needs to get between 6 and 8 hours sleep a night, and if you’re not getting this then, you need to change your bedtime. Perhaps most importantly, when you sleep your level of cortisol drops; you actually relax. It also allows your hunger and appetite hormones to balance; reducing your need to eat during the day. Depression is an increasing issue in modern society despite the connectivity offered by social media. If you don’t connect with others, then you will start to feel isolated, vulnerable, and ultimately this will increase your anxiety levels. You can avoid this by building physical friendships, connecting to other men through FF30X and by building a social media network. Exchanging ideas helps you to keep your own life in context. Anger increases your stress levels and can do a tremendous amount of damage to relationships. You need to learn to release your opinions in any matter in a controlled and calm voice. There is nothing wrong with being opinionated or assertive. However, the moment your voice starts to rise you’re bordering on anger. This is when you need to step back and take a deep breath, releasing the stress before you continue; you’ll feel much better for it. Understand how stress and weight loss/gain are linked. Take steps to reduce your stress levels. Start exercising and eating healthier to improve your overall health. Reach your target weight; whether higher or lower than today. Join FF30X today, and we’ll support you in every step of your journey; us and the thousands of other members! *Please know that weight loss results & health changes/improvements vary from individual to individual; you may not achieve similar results. Always consult with your doctor before making health decisions. This is not medical advice – simply very well-researched info on stress and weight loss.